Over a thousand years before the book's present, there was a war that effectively destroyed all of society. Picking up the pieces of the technology that was left behind, London was put onto treads, run by steam, so that it find and consume other towns for resources and, ultimately, more fuel to keep moving. Over time, other towns and cities did the same, while another group, called the Anti-Traction League, created a defensive wall across the only pass in a mountain range to keep these traction cities at bay on the other side. This gives the background of how steam is the primary driver while other technology - well past steam - is also present. 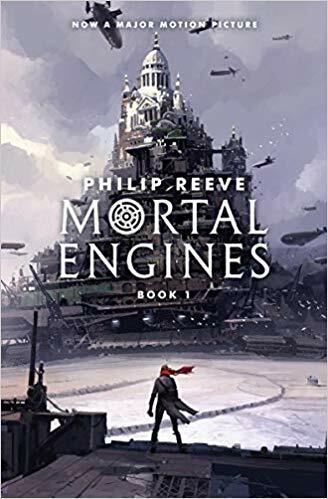 By putting steampunk over 1000 years into the future, this book represents one of the best thought-out steampunk universes I've ever read. The social constructs around living on - or avoiding, predatory cities are incredibly well thought out. That is, this presents as a plausible future. The story is mostly told from the perspective of Thomas, a young Londoner who is a "Third-class apprentice at the Museum of London". The hero of this story is a young woman named Hester, who is trying to avenge the murder of her parents. The first action of this story is Thomas preventing Hester from killing her target, and subsequently falling off of London with her. In the best science fiction tradition, this ornate, fantastical background is a perfect set-up to reflect our present back on ourselves. At its core, this book is about learning to accept that heroes may be false and that a character's society, itself, might be built upon evil. The story is incredibly well done, though there are a few parts where the dialog between people is a little flat. The masterful pacing and very well described action more than makes up for the places where odd dialog momentarily bumped me out of the story. If you plan on reading the book and seeing the movie, I recommend watching the movie first. The stories hit the same core-points, though the movie is much more of an action adventure than well balanced action and story. For me, at least, the book fills in large amounts of detail, some of which was hinted at through movie dialog. 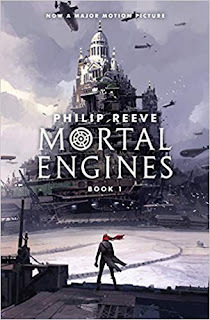 If you like Sci-Fi or Steampunk, I highly recommend this book. Trigger warnings for slavery and extreme violence. Skip it if you prefer fiction to be in the known world.